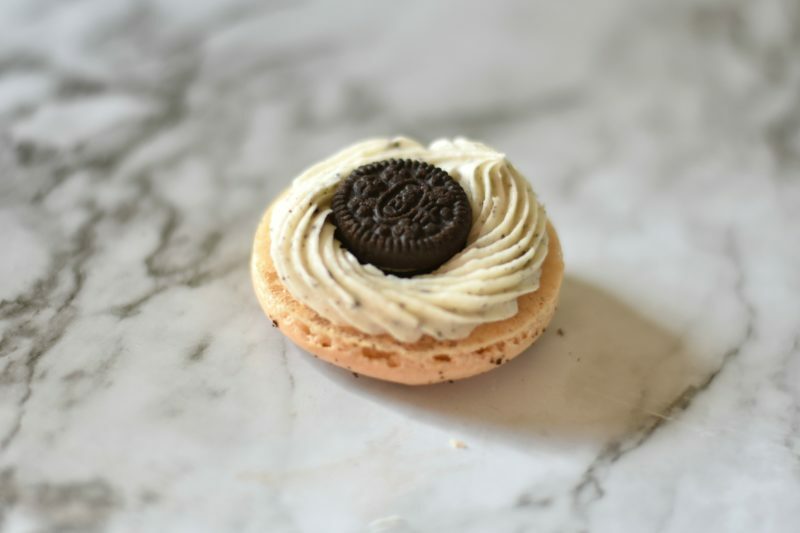 Are you looking for a delicious macaroon recipe? 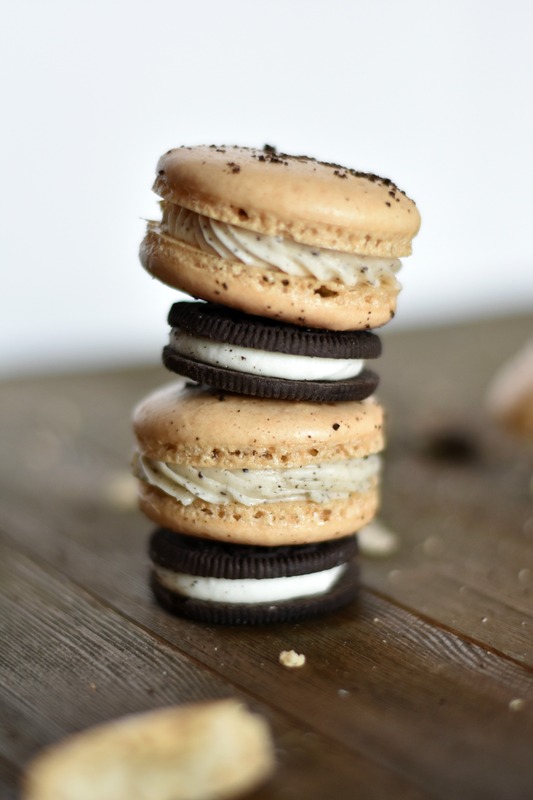 This recipe adds Oreos into the traditional macaroon recipe. 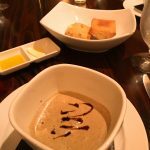 Chocolate AND macar0ons, yes, please! Now macaroons can be a little tricky to make. However, follow this recipe, and you will have amazing macaroons in no time. So what do you need to make Macaroons? 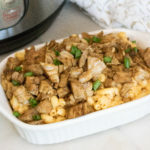 So now that you have your ingredients ready how do you make these things? First, weigh out all of your ingredients. Weighing is an essential part of the instructions because macaroons can be finicky if exact measurements aren't used. Once you have everything weighed and ready sift together your almond flour and powdered sugar in a large bowl and set aside. Next, add your egg whites to the bowl of your mixer and start mixing on medium speed until they get nice and frothy. When this step is complete add in the salt. Now you want to gradually add in your sugar to the egg whites and mix on medium speed until you get a soft peak consistency. Once the egg whites are the right consistency, add about 1/3 of the dry mixture to the egg whites and fold in until there are no dry spots left. Add in the remaining dry mixture to the meringue and fold in until there are no dry spots. Begin to check for the “ribbon” stage, where the batter falls off in ribbons, and you can make a figure 8 without it breaking off. When you reach this consistency stop folding the batter. Next prepare your piping bag. You will want to use a medium round tip for these. As a tip, you can place your piping bag in a large cup to make it easier to add your batter. Pour the mixture into the piping bag slowly. 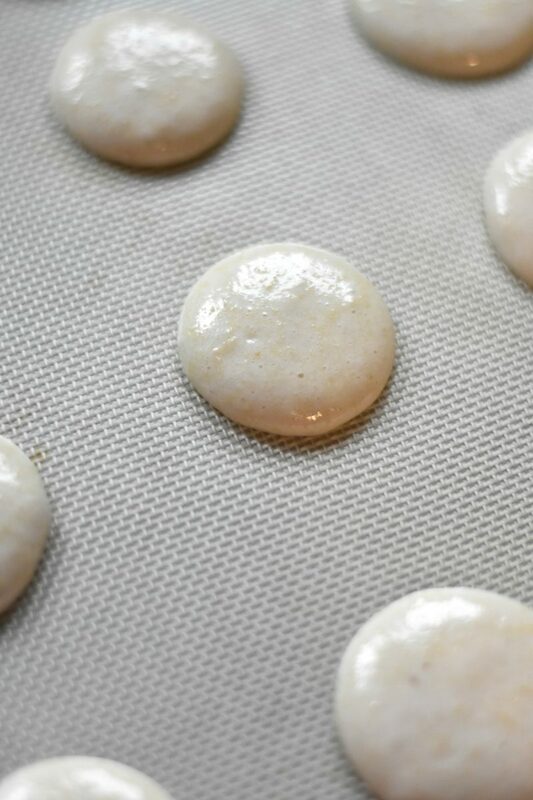 To get the exact macaroon shape, place the macaroon template under a silicon mat on a baking sheet. Now, while you are piping, you will want to hold your piping bag completely vertical and lift straight up. Aim to make circles that are about 1 1/2 to 2 inches. After you have piped all the batter, you need to remove the air bubbles from the mixture. You will do this by banging the baking sheet on the counter 10-20 times which should remove all the bubbles. If you have a few stubborn ones left you can use a toothpick or something sharp to pop them. At this point, you can top the batter with crushed Oreo cookies if you would like. 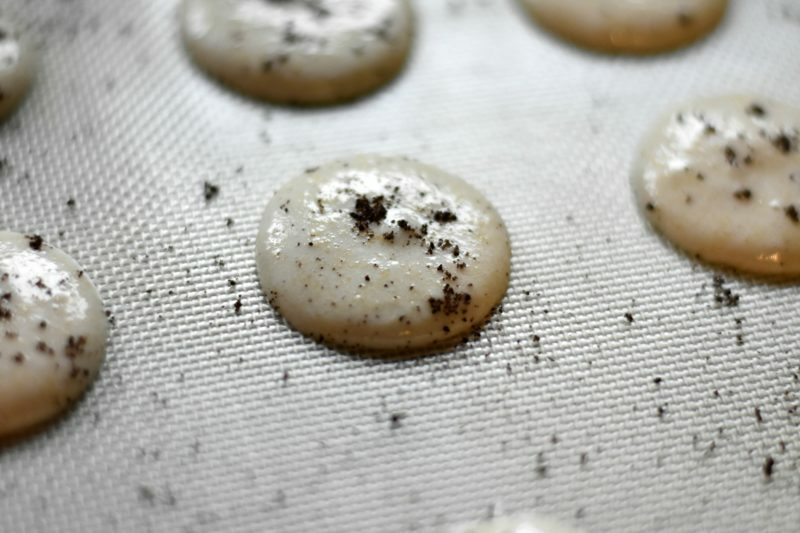 Next, you need the macaroons to dry. This drying is accomplished by leaving them on the counter for thirty to sixty minutes, or until you can touch them and feel a “shell” form over them. Give them a gentle touch, and make sure no batter comes off on your finger. To bake the macaroons, preheat your oven to 300 degrees F. Your macaroons need to bake for ten to fifteen minutes or until lightly browned. When the baking is complete, you should be able to touch the top of the macaroon it should not wiggle around on the “feet.” Allow them to cool COMPLETELY before taking them off the baking sheet. Now we move on to the buttercream. Start by creaming the butter in the bowl of a stand mixer or using a hand mixer. Once the butter is finished, add in the powdered sugar slowly with the mixer on a low speed and mix until thoroughly combined. Next, you need to add in your vanilla and mix until light and fluffy. 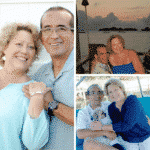 This process should take about two to three minutes. Once this step is complete add in the crushed cookies. 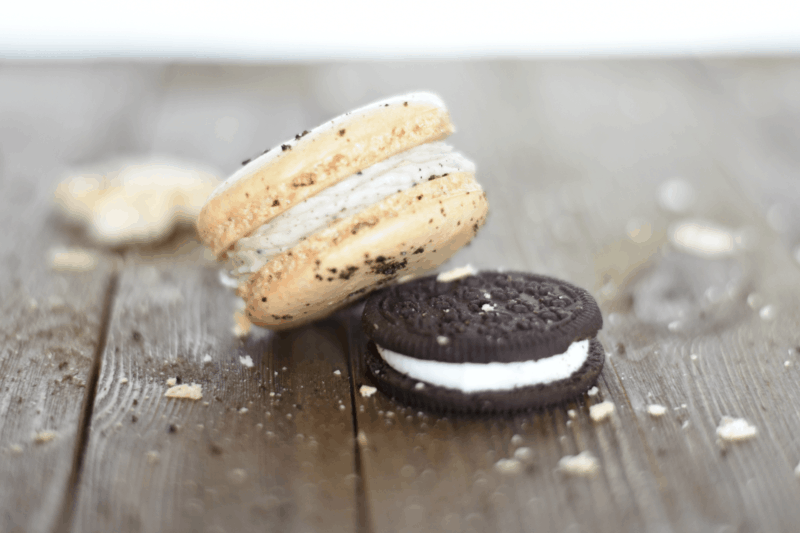 There you have it, a delicious recipe for Oreo Macaroons. What are you waiting for? Try these today! Top with crushed oreo cookies if desired at this point. Cream the butter in the bowl of a stand mixer or using a hand mixer. Add in the powdered sugar slowly with the mixer on a low speed and mix until completely combined. Add in vanilla and cream and mix until light and fluffy about 2-3 minutes. Finally add in the crushed cookies. Place the frosting in a piping bag with a star tip. 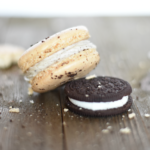 Place a generous amount on half of the macaron shells in a circle, and add a mini oreo to the middle.